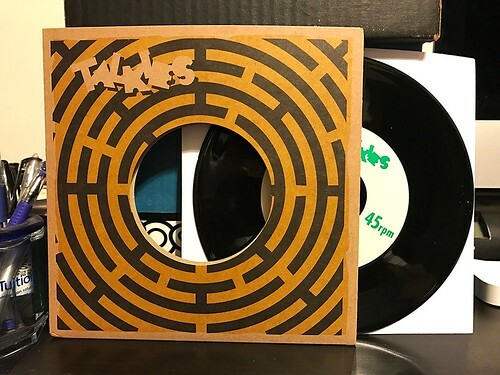 I Buy Way Too Many Records Dot Com: Talkies - Never Fear 7"
Another new band courtesy of the La-Ti-Da singles pack I bought and this one is a keeper. Talkies are playing the sort of upbeat power pop that I really dig. There are certainly nods to the hits of the 70's, but unlike a lot of power poppers, Talkies aren't a nostalgia band living in the past, these guys take those older influences and bring them up to date. A side "Never Fear" is an upbeat toe tapper with jangly guitar riffs and really catchy backing harmonies. There's even a nice little shredding guitar solo towards the end, but it is brief and doesn't wear out its welcome. On the B side is "Hollow," a slightly more subdued number. This one actually reminds me a lot of Warm Soda, though with completely different vocals. It's laid back, but still a catchy song that I dig. I definitely want to hear some more by this band, but I think this is their first release. Google isn't helping much anyway and there appear to be at least two other bands called Talkies. Regardless, I'll be on the lookout for anything else these guys put out.